A couple of days late, but there was a Day Four on the ski slope! Since it was the first day of the changeover from warm weather back to cool and wet, we were slow-moving in the morning and debating whether it was worth it. Then hubby looked at the web cams and pointed out that despite the temperatures, it wasn’t raining at Timberline–yet. 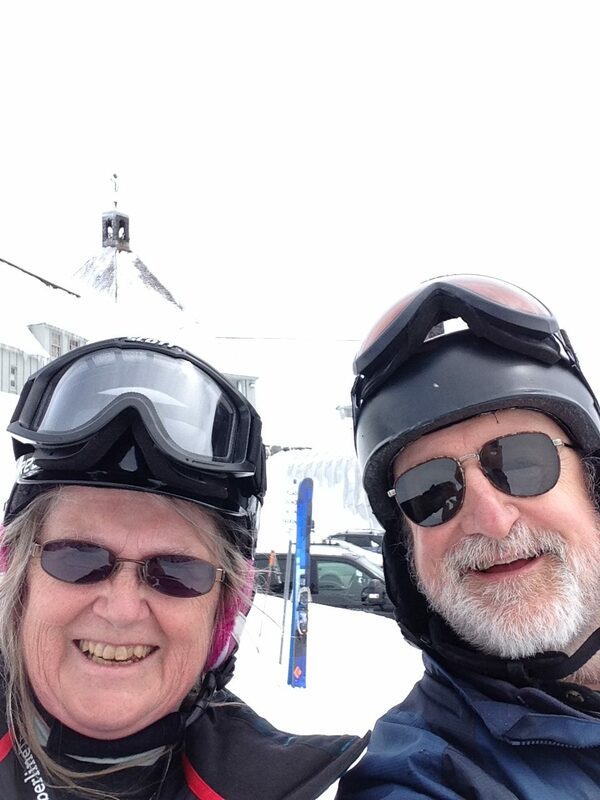 So we saddled up and went skiing. I’m glad we did. I hooked into the flow this time, despite a knee locking up on me in the parking lot. Once we started skiing, though, the knee was quiet. I glided from side to side, smoothly curving and transferring weight, just like I wanted to do. No problems with thigh burn or the aches that go along with overcontrolling the skis. Everything was balanced and in control. I was right. We got home and I saw that the skis needed another hot waxing. In any case, we got in two runs on the Mile before it got socked in and we retreated to Norman. Four runs on Norman, two on the mile, for a total of five miles skied. Getting the legs back, getting the flow back…but I’m still not entirely feeling the passion that I did before. Maybe it’s because of the lateness and missing the big seasons. 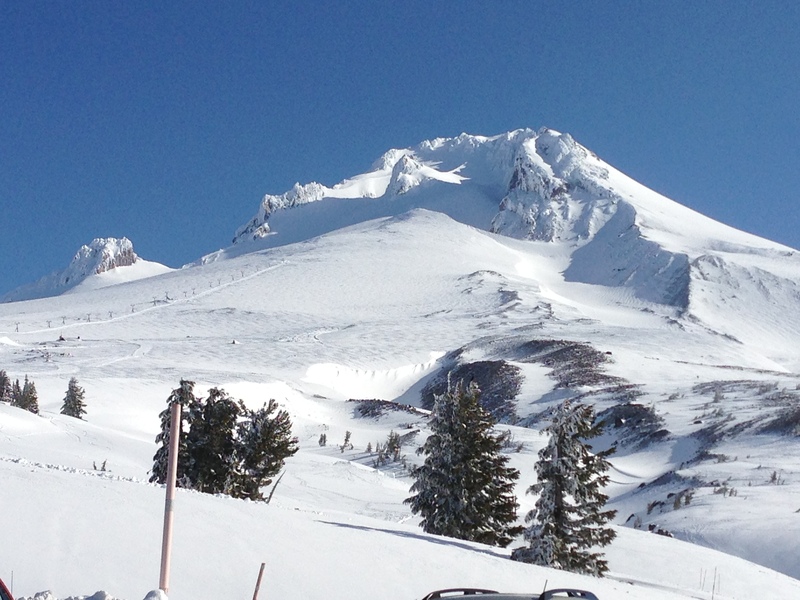 We’re looking at two more sessions at most, for a total of six ski days this season. Not bad, but…at the end of six I’m just getting tuned up. 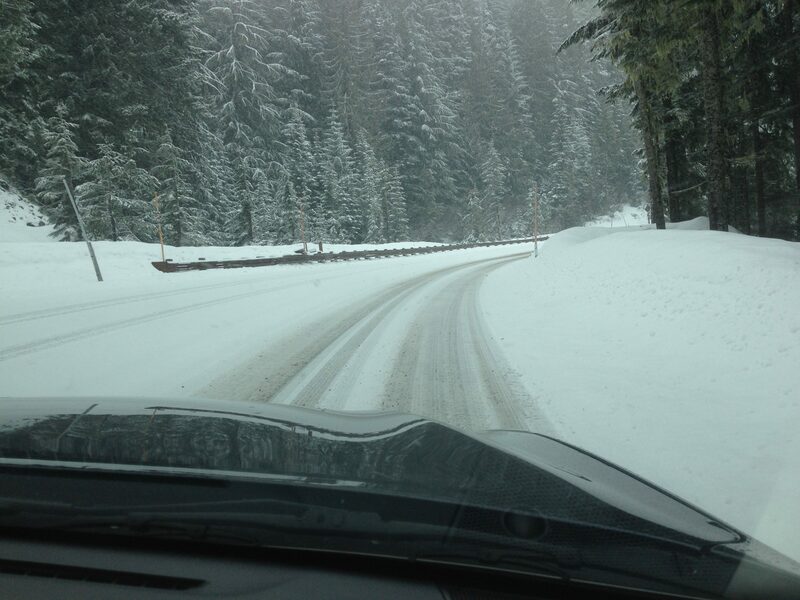 Our second ski day was more like the depths of winter than the end of April…unless you’re on Mt. Hood. The weather system that Cliff Mass calls “Darth Vapor” is dumping snow on the Mountain, fine, wet powdery stuff…and I got a reminder that Timberline Road in some ways is a tougher drive than crossing the Blue Mountains via Tollgate. The official snow count this morning was 199 inches at the lodge. I’m willing to bet it had gone over 200 by the time we got our skis on and got out there. It continued to snow, a wet powder that formed rime ice on our ski pants and parkas along with a mild wind. We went back up to Stormin Norman simply because given our level of conditioning, it’s the easiest run to do with blowing and drifting snow. My knees were fussing at me first thing this morning so I didn’t want to push it. Not sleeping well last night didn’t help, either. I started with fatigue and it didn’t help things. 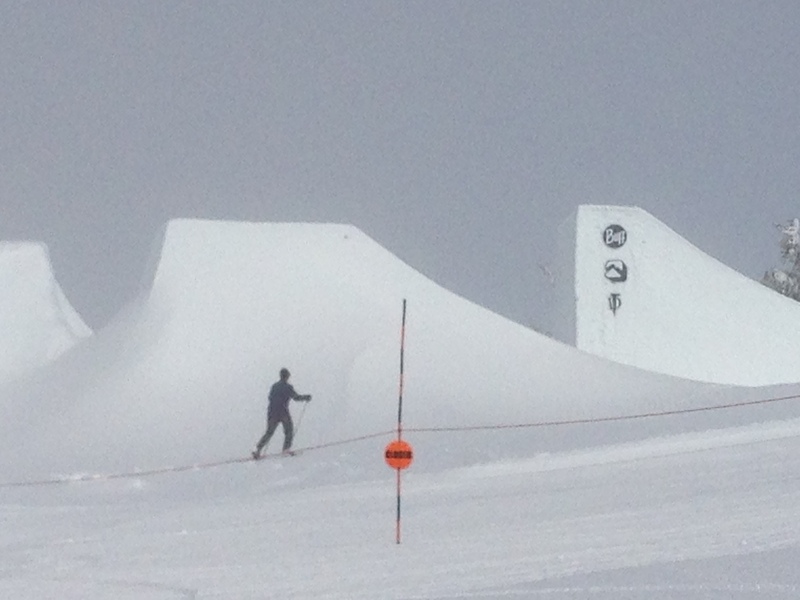 My first run down, I bobbled a couple of times but didn’t tweak anything and stayed upright. The second run was better, and the third run was when I started to feel the flow coming. But then the fourth run was just not quite right, so I didn’t find the flow. The wind was also such that above the trees it was occasionally hard to see where the snow ended and the air began. When we headed back to the lodge, I encountered a few surprise drops, and had to stop in one place to figure out where to go. On the other hand, my feet didn’t cramp up in the boots today. That’s a big plus. I’m getting them back into shape. There was a big living quarters horse trailer in the parking lot. Obviously there weren’t any horses in it–I had to wonder if it was hauling equipment while the owners were staying overnight in the living quarters, or maybe that was the only trailer they had. We saw some very happy snow doggies in the parking lot, romping in the snow. On Tuesday we saw one dog who was ecstatically rolling in the snow–nothing like that today, but nonetheless there were happy snow doggies around. No spectral whooshes from the ravens today, though they were scouting the parking lot for any food scraps. By the time we left, a little six-inch drift was forming by the rear driver’s side wheel. 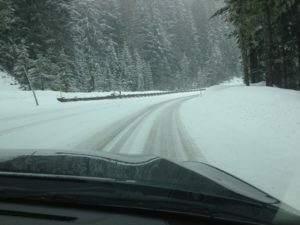 Driving down Timberline Road had some interesting moments with slush and ice. But we’ve survived another ski day, and I’m beginning to trust my legs and feet again. One thing I am noticing is that my hips are stronger than they were before. It’s easier for me to stand up and get out of the chair. I can thank those long rides on Mocha for that, I think. Now I just have to be in better shape….